at1042 Kearny Street (415) 398-9696 is a North Beach institution that seems to have a line every day from 530pm onwards. It is an old school Italian eatery that hasn’t changed much. Big communal table down the middle. A small basement eatery with old fashion decor and yellow lighting, this is a classic and full of tourists. They are well know for their wood-fired brick oven pizza. Their lighting was very dim and yellow, so our pictures have a tint. They have a different specials menu every month. 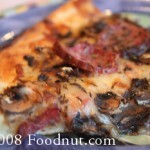 Pizza with Mushrooms and Sliced Italian Sausage (12in $18.50) - Good thin crust (Not super thin) that isn’t soggy in the middle. Slightly burned on the edge. Good toppings and Sausage. Pizza Super Deluxe (Mushrooms, anchovies, peppers, ham, Italian sausage and fresh tomatoes) (12in $20.50) - Wow this is getting expensive for pizza. A little mushy because of the fresh tomatoes. The Anchovies are real salty. If you like deep dish, go to Zachary’s in Oakland or Little Star Pizza. If you like Neapolitan pies, visit A16 or Pizzeria Delfina. We would goto A16, Antica, or Delfina for better Italian food at a similar price. They offer to go service. I will give Tomamasos Pizza in San Fran 4 out of 8 slices. Thank you foodnut for this review!